Rummy originates from the US and comprises of many different variants, but the focus now shall be on learning how to play Vegas three-card rummy. This online rummy game is widely available at Microgaming casinos, such as Captain Cooks and Luxury Casino, so it’s useful to understand the rules in-depth. • Deck: an online rummy game can use a 52-card or a special shoe of multiple decks and, perhaps, additional cards. • Stock: once the players have been dealt their cards, the remainder are left facing downward in the middle of the table. Those cards are known as the stock and the dealer continues by lifting a single card to face upward. • Melds: the term meld is used to encompass both sets and runs, which are the types of hands that you will need in order to score and win hands against fellow players or else a single dealer in a casino setting. • Sets: these are hands where you group together matching cards. For example, three kings of different suits would classify as being a set. • Runs: for these hands, you need to collect three consecutive cards of the same suit. For instance, 7-8-9 unsuited does not qualify as a run in rummy, whereas that hand would be a run if the cards were all of the spades variety. • Wild cards: some rummy variants will include a joker or other wild cards for the purpose of aiding players in the creation of melds. As an example, a joker could be used to fill the place of a missing queen in a set. • Adding/shedding: the process varies depending on the game’s online rummy rules, but each variant generally allows for players to discard cards and obtain new ones. • Showing/scoring: this is the stage at which all participating players will show their hands. In turn, this will lead to the scoring of online rummy hands. If playing against a rummy dealer online, then the aim is to score fewer than them in the Vegas-three card variant. Now that the basics have been explained, you are ready to read through and understand the rules of Vegas three-card rummy online. As explained, rummy can often use a 52-card deck, and this is also usually the case with this Vegas variant. Some of the other initial rules include the fact that aces are scored low, but all other cards are ranked based on poker rankings. Ultimately, your goal is to finish the hand with fewer points than the opposing dealer, but all will become clearer as you advance through the rules. At the start, you have to begin by making an ante bet, based on the size of your bankroll and the limits imposed by the rummy table, of course. In some instances, you might also have the ability to place a bonus bet to cover other outcomes and occurrences. After the ante bet has been placed, you and the dealer shall each receive three cards, all of which are going to be facing down. As you can gather, the target outcome in online Vegas three-card rummy is to use all of your cards in a meld. If you manage this, then you will have zero points and be in prime position to beat the dealer. For clarification, if there is more than one way to score a hand, then the lower value will always be used unless stated otherwise in the house rules. Once you have received your cards, you will have the choice of raising or folding against the dealer. 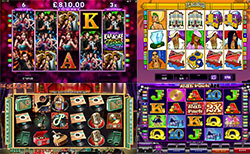 Considering the compressed nature of this variant, most casinos do not include the stage of adding and shedding cards. If you choose to fold, then you lose the hand and, subsequently, your ante bet. However, you will have to double the value of your ante if you wish to remain in the hand and have a chance of defeating the dealer. At this point, the dealer will review his hand and shall only see the raise if they have 20 points or fewer, as that is the qualification threshold. If the raise is met, then the player and dealer shall turn over their cards. In the event that the dealer does not qualify, then the player will win the ante bet, while their raise will be pushed back to your bankroll. When the dealer does not qualify, their score will be compared with yours and the lower total will always. You can potentially lose both the ante and the raise if the dealer has the lower score. For reference, a tie will always result in a push. Winning the ante bet results in the straightforward outcome of an even-money payout from the dealer. However, the online rummy payouts get slightly more complex in the scenario that you are able to better the dealer with your raise bet. As you can see, the hallowed score of zero is going to be good enough for a massive 4/1 payout at the dealer’s expense. From one to five, you can still command sizeable 2/1 payout, whereas a win with six points or more will deliver only even-money to your bankroll. Earlier, it was mentioned that Vegas three-card rummy offers the potential for placing a bonus bet next to the ante, but before the time comes to decide on raising or folding. The following table shall outline the possible rummy bonus bets and payouts that are made available in this Vegas variant. The bonus bets don’t require you to bet on specific outcomes, so you can win quite easily if you are able to beat the dealer. And you don’t even need to get an A-2-3 suited to do well, as a zero score can occur quite frequently and even comes with a handsome 25-1 payout as well. For that reason, you should not be afraid of the bonus bet when available. Something to remember is that your score depends on all three cards. You could have zero points from your two queens, but remember that the presence of a 10 would bring your total score up to 10. Comparatively, this casino-based variant is so much simpler compared to the rummy games that are undertaken by tables of players. As such, Gambipedia.com advises further learning before taking on the more complex rummy games online.